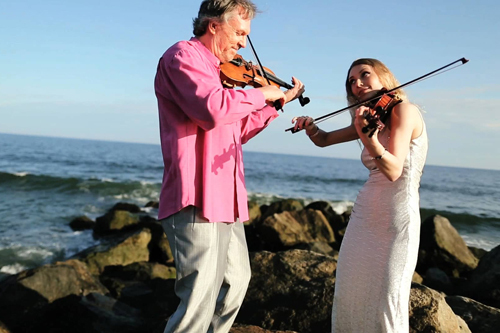 “In music of the 1700s, 1800s and the early part of the 20th century, the violinist or fiddler carried the weight of the group,” says virtuoso violinist/fiddler Mark O’Connor. “Everybody else kept playing and just went with it. But as musical literature for bands became more sophisticated, the violin somehow lost some ground. 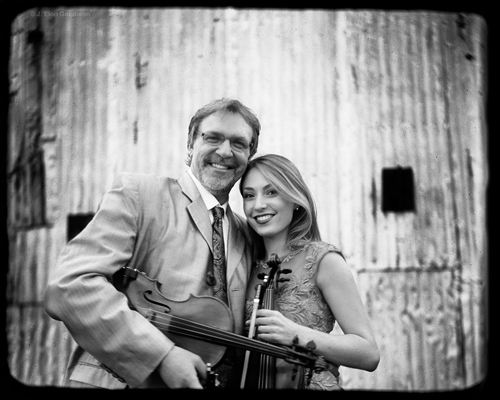 So with our teaching, we double down on the role of accompaniment being significant.” O’Connor and his wife Maggie – an acclaimed, conservatory-trained violinist herself – have scheduled workshop-and-concert dates around the USA, including a June 18 date in Asheville NC. Mark O’Connor has already had a long and illustrious career. His early teachers – “mentors, really,” he says – were bluegrass fiddler Benny Thomasson and legendary French jazz violinist Stéphane Grappelli. O’Connor toured and recorded with both, playing Carnegie Hall at age 17. O’Connor would go on to success in nearly every musical genre: he’s won two Grammy Awards, been named six times as the Country Music Association’s Musician of the Year, recorded and toured as a member of Atlanta-based jazz/rock group Dixie Dregs, and sparred with Charlie Daniels on “The Devil Comes Back to Georgia,” a 1993 sequel to Daniels’ 1979 smash hit single. O’Connor has released more than 40 albums, and was recently the featured American performer at a concert staged at the Berlin Konzerthaus. But these days his primary focus is on education in the form of violin duos. The evening concert will feature a mix of O’Connor’s solo pieces and a selection of duos performed with the former Maggie Dixon, a graduate of the Peabody Institute where she earned her Master of Violin degree. “Maggie had grown up playing bluegrass and fiddle music,” O’Connor says, but her formal training didn’t satisfy her desire to explore those folk forms. So she rang up O’Connor and asked for a lesson. The night after her first instruction, she joined O’Connor onstage at a New York City gala. O’Connor says that they quickly became “inseparable,” marrying in 2014.